By Sean Savage (JNS) The local affiliates of Students for Justice in Palestine at Cornell and Binghamton universities in New York state have been promoting images created by a Palestinian terrorist organization on their respective social-media pages. 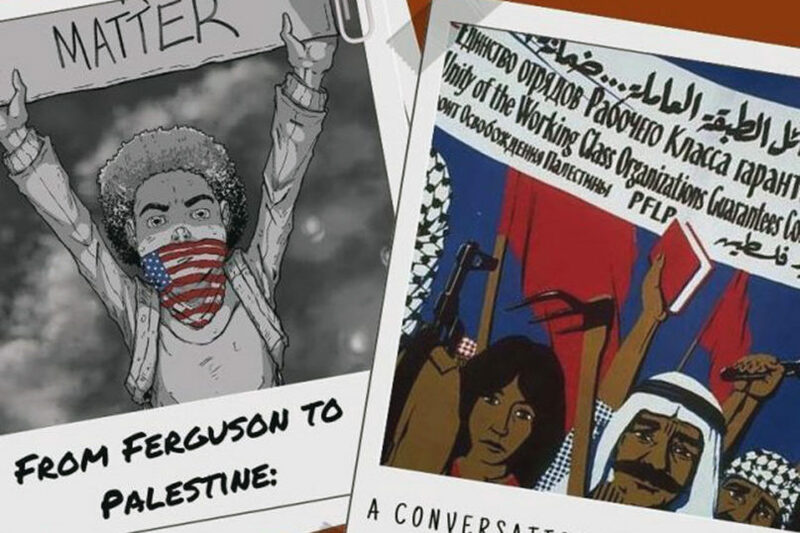 Ahead of an expected BDS vote in late April, Cornell SJP hosted a recent teach-in titled “From Ferguson to Palestine: A Conversation Surrounding Struggle,” featuring an event flyer that appeared to depict a rifle and explicitly mentions the Popular Front for the Liberation of Palestine (PFLP), according to CAMERA. Additionally, the Cornell Collective for Justice in Palestine, which is part of SJP’s pro-BDS coalition, has an online profile picture of a mural of Leila Khaled holding a rifle. Khaled a member of the PFLP – and euphemistically referred to as the first female hijacker – was responsible for the 1970 Dawson’s Field hijacking. Founded in 1967, the PFLP is a Marxist-Leninist far-left Palestinian organization that has carried out numerous terror attacks, including the hijacking Israeli and Western planes in the late 1960s and early ’70s, the assassination of former Israeli Knesset member Rehavam Ze’evi in 2001, and suicide bombings during the Second Intifada. Several countries, including the United States, Japan, Canada, Australia and the European Union, consider the PFLP a terrorist organization. The SJP affiliates at both schools have had a history of anti-Israel and antisemitic actions that have intimidated and threatened Jewish students. In 2014, after failing to pass a BDS resolution, SJP members were recorded saying “F*** you, Zionist scums,” and “I will f***ing slap you.” In 2017, in response to a Yom Ha’atzmaut celebration, SJP held a “die-in” in the same room. Cornell’s president, Martha Pollack, recently issued a letter rejecting SJP’s call for a boycott of Israel.